Our feet are inherently problematic (they're too flat, they pronate too much, etc), and the goal of the foot doctor is to correct these problems with technology. We believe that nature designed the foot in an optimal way; and therefore, the best way to treat foot problems it to return the feet to the shape and function that nature intended. : The foot is inherently misshaped. 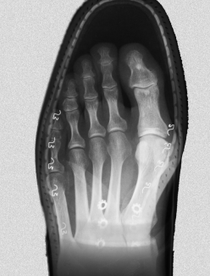 The way to correct foot problems is by using orthotics or undergoing surgery. Look at the foot of a young child. You will notice that his or her toes are spaced well apart. The foot of a young child is naturally designed for optimal balance and gait. Their widely spaced toes, along with the ball of their foot and their heel, provide an optimal base of support for their arch. If the foot maintains this shape, optimal stride is preserved through old age. This is what is seen in societies that go barefoot or wear predominantly flip-flops. In industrialized societies however, people spend a life time wearing shoes with rigid soles and tapered toe boxes, a situation which inevitably leads to a change in foot shape. This deformation of the foot by the shoe is what leads to foot, ankle, knee, and other muscle and joint problems. Thus, the foot is NOT naturally misshaped. In most cases, it starts out just right. The way to address most foot and ankle problems, then, is not through use of orthotics or surgeries, but rather by allowing the foot to return to its natural form, with level forefoot and heel, and with the feet's natural toe splay encouraged. Myth #2: Athletic shoes are good for feet, because they are flat, they absorb impact, and they support the heel and arch. Most people know that high heels are more about fashion than function, but what's wrong with athletic shoes? If you examine footwear designed for sports, you'll notice that even these shoes elevate the heel, extend the toes, and pinch the toes together. Instead of enhancing performance, this triad of design features actually compromises the natural gait cycle, leading to chronically tight foot and toe extensor muscles and structural changes in the toes themselves (i.e., the toes are forced toward the foot's midline where they remain, permanently, unless steps are taken to reverse the wedge-shaped toe deformation). The foot functions best as a barefoot, that is, when the heel and forefoot are completely level, and the toes are allowed to flex, extend, and spread. Myth #3: Foot problems are just a natural part of the human aging process. Foot and musculoskeletal problems are astoundingly common on our modern society. But in fact, they are NOT a natural part of the aging process. Rigid footwear, for reasons explained above, plays a much bigger role in physical degeneration than most people realize. And it certainly contributes more signficantly to foot problems than does the aging process. Remember, in societies that do not use rigid footwear, people don't suffer nearly the same rate of lower extremity arthritis and foot problems, even well into old age. Myth #4 : "Flat" feet or high-arch feet are problematic. They must be managed with orthotics or other forms of arch support. Contrary to popular belief, in most cases, the height or length of the foot arch is not the issue. People can have optimal stride with either a high or a low arch. What's truly important, however, is the base of support. This support is naturally built into the foot, with the heel, forefoot, and evenly spaced toes serving as the ends of the arch. If this natural foot is able to walk without the confinement of narrow, rigid shoes, then external support devices, such as “arch support” insoles or orthotics are NOT required. True support of the arches of the foot would suggest that the ends of the arches, on either end of the foot’s open space are the structures to be supported. This would mean that the heel and the forefoot joints are the structures that should be supported, and not the structures in between the ends of the arch.